This script provides very simple audio encryption. It allows you to store audio files inside the rgss3a archive. The data is decrypted and created outside of the archive when the game wants to play an audio file. This means that while it is possible to easily copy the file once the game starts playing it, you can still protect files that they have not managed to unlock during the game. 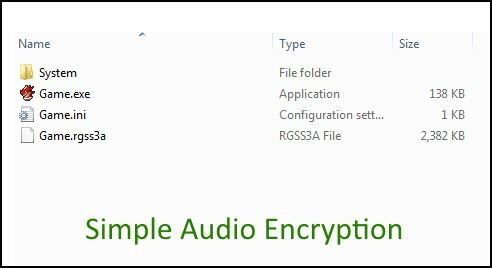 Follow these steps to encrypt your audio files. You should do this when you are ready to distribute your project. You can verify that when you extract the game, your audio files are no longer visible until you need it. To resume working on your project, simply move the audio folder back out. This technique is sufficiently fast for music files around 5 MB. For larger files, you may notice some delay depending on your hardware, particularly your hard-disk. Write-access is required, so you won’t be able to play it off a CD. Hey, Hime. Is there a way to save the real time files into, let’s say, “APPDATA/MyGame/Audio” folder? When RPGMaker compresses the project, it will create an encrypted archive for you. Don’t worry about that part; you just need to compress your project. Hello, may I know what’s the license on this? Hi, Hime! I don&apos;t mean to bother you with what may seem a simplistic question, but does it compresses the data as well? Does it work with .mp3 files or must they be .ogg? Thanks! The default archive format does not compress audio files. It supports all audio files that RM supports. Describe what you are looking for on the <a href="https://github.com/Hime-Works/Requests/issues?state=open">issue tracker</a> this doesn&apos;t seem like something that would fit in a comment box. What if I wanted to encript my graphics without making the editor encripted as well?